We finished the first three “on a roll” scarves! Working on these together was a lot of fun. Some of us really felt challenged by the randomness of the roll 🙂 We are more comfortable when things have a pattern that we can follow, and that we think looks nice. But, we stuck with it and in the end were pretty pleased with how they turned out. Not only did we end up with beautiful finished projects, but a true sense of fun and community from working on scarves together in a new way. So, we have a new plan for April, we’re going to pass scarves around and have several of us working on the same scarf. 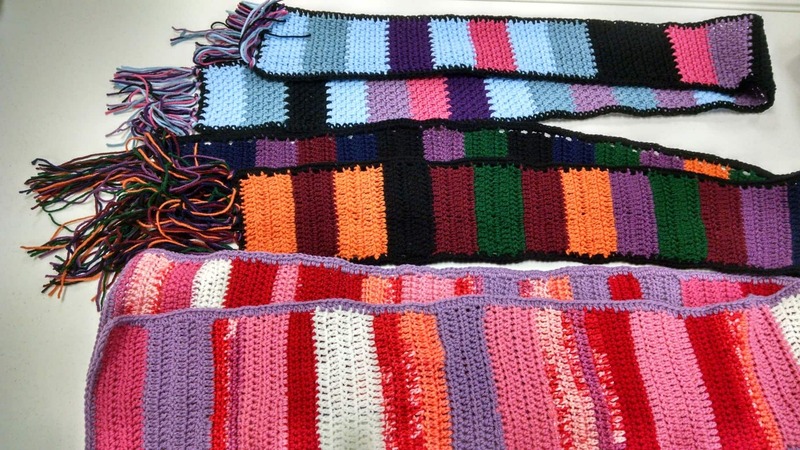 We’ll each have a color and make stitches till the time is up and then pass them around and keep going on the next one. We’re pretty excited about trying out a new way of doing things. Please join us if you can! Previous PostPrevious We’re on a roll! Next PostNext They did it!